An accomplished actor, producer and singer, Alan Doyle is best known as a member of Newfoundland’s Great Big Sea. Earlier this year, he released his second solo album, So Let’s Go, an album that distills Doyle’s traditional Celtic influences. Doyle has also produced albums for actor Russell Crowe and The Irish Descendants as well as numerous film and television soundtracks. On his new album, he worked with producers such as Thomas ‘Tawgs’ Salter (Lights, Walk Off The Earth), Jerrod Bettis (Adele, Serena Ryder), Gordie Sampson (Keith Urban, Willie Nelson), and Joe Zook (OneRepublic, Katy Perry). The title track is a rowdy anthem that will undoubtedly translate well on the stage. Doyle called us from his home to talk about the album. What’s it been like playing these shows? It’s been incredible. Lots of sellouts. It’s just a great night out. I’m doing songs from my record and a bunch of stuff from the Great Big Sea catalog. I do some Newfoundland traditional music too. It’s been a great ceilidh every night. Your new album is “an album for celebrating the good times.” Talk about that. I joke that I wrote songs for a concert more than a record. I wanted these songs to be the cornerstone for a great night out for people. I wanted the songs to be ideal for a great concert. The opening number is really exuberant. “So Let’s Go” is a bit of a personal mantra of mine that I’ve had for years. It’s a call to action. In my mind, it’s the simplest piece of advice I give people over the years. So often people overthink things and doubt things and wonder if they’ll ever get a chance to do things. They say, “I want to go downtown.” I say, “So let’s go.” They say, “I want to go to Europe.” I say, “So let’s go.” “I want to go back to school to learn to be a dentist.” I say, “So let’s go.” It’s really a call to action and a celebration for people who realize that time is short. Your last album came out three years ago. Talk about Boy on a Bridge. That album was like a travelogue. I intentionally wanted to leave the tricks I learned behind. I wanted to make music in my friend’s backyard. I wasn’t terribly interested in bringing my own stuff into it. I wanted to learn new tricks. 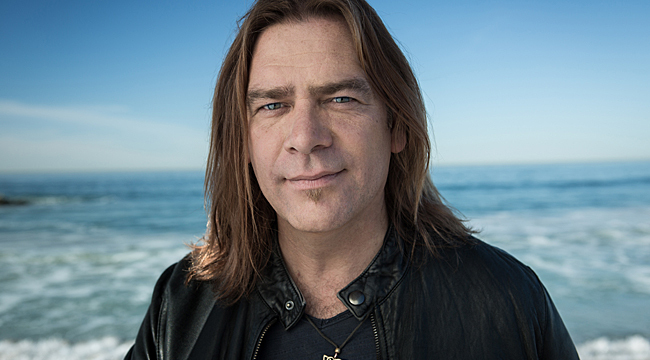 I’ve been making music in the Great Big Sea camp for close to two decades. We did it in a similar way. We brought people into Newfoundland. We adapted and molded the music around that. We had a simple goal in mind. With Boy on Bridge, I wanted to go to Nashville and make songs the way they make songs down there. I wanted to go to LA. and use a soundstage and make songs the way they make songs there. It was all about learning new stuff. On So Let’s Go I brought my Celtic music upbringing, what I learned in my fishing town and all the traditional music techniques from Great Big Sea into it. So where did you record? Different places, depending on who I was working with. There’s a guy named Tawgs Salter. He works in a little town called Ridgeway, Ontario. I went there for a bunch of the record. He’s a very pop music guy but he does that kind of pop music centered on something small and folky. He had great success with a band from Canada called Walk Off the Earth. They have the five guys on one guitar trick. They’re music sounds huge but at the center of it is a guy playing the ukulele. I love that idea that it’s a huge production centered on something small and folky and honest. I did a lot of the record there. I worked with another producer, Jerrod Bettis, who works with Melissa Etheridge and Serena Ryder. Then, I finished in my studio at home. I was born into a very musical family in a small fishing town on the coast of Newfoundland where, unlike even isolated towns on the coasts of America, there was nobody coming to entertain us on a Friday night. There was no rolling cavalcade. My parents had to learn to do Friday nights themselves. The Doyles became the minstrels of the town. They still are. I’m just one of my Doyles. They’ve learned to make it for themselves. I’m part of that tradition. You hear people say they learned their lessons the hard way. I learned them the easy way. I was 12 before I realized that everyone didn’t play guitar. I thought everyone played guitar. Is it true that the guys in Great Big Sea recruited you because you had a van? That’s been my joke for years and they’ve never corrected me on it. The story of it goes that the other three members were in a very successful band called Rankin Street. They played pubs for four or five years and had a huge following but they didn’t have the exact lineup they wanted. They wanted a guy who could write rock music and they saw me play in some pubs in downtown St. John’s. I was doing solo gigs. They recruited me for this new band that became Great Big Sea. Did you think it would last for two decades? I had no idea. It’s easily been the biggest blessing of my life. It’s such a wonderful thing to call the mothership. What was the 20th anniversary tour like? It was awesome. Every night was unbelievable. Every gig was sold out. It was the only time in our 20 years that we stopped for a second to, dare I say, pat ourselves on the back. We just went, “We did it.” That was the best part. Not officially. Séan McCann wants to leave the band and has gone on to another career path. He does public speaking. I’ve done my stuff but I would like to do Great Big Sea stuff too. It’s a complicated thing because Séan still owns the name. We have to administratively figure a way get him out of it and then creatively figure out a way to do it without him. It’s very difficult.